ORION RETURNS! Everyone’s favorite constellation is Orion the Hunter. Orion cuts a dramatic figure in the heavens, easily spotted by the three stars of Orion’s Belt, frozen in his timeless celestial battle with Taurus the Bull. Though best seen in the cold months, Orion is invisible during the summer, between the months of May through July, hidden behind the bright glare of the Sun. But in August, Orion emerges from the sunrise and can be seen low in the east during dawn twilight. By the first days of fall, Orion can be seen in all his glory in the early mornings before sunrise, hanging high in the southern sky at the meridian before the break of day. In the days, weeks and months that follow, Orion will reach his highest point at the meridian at earlier times. 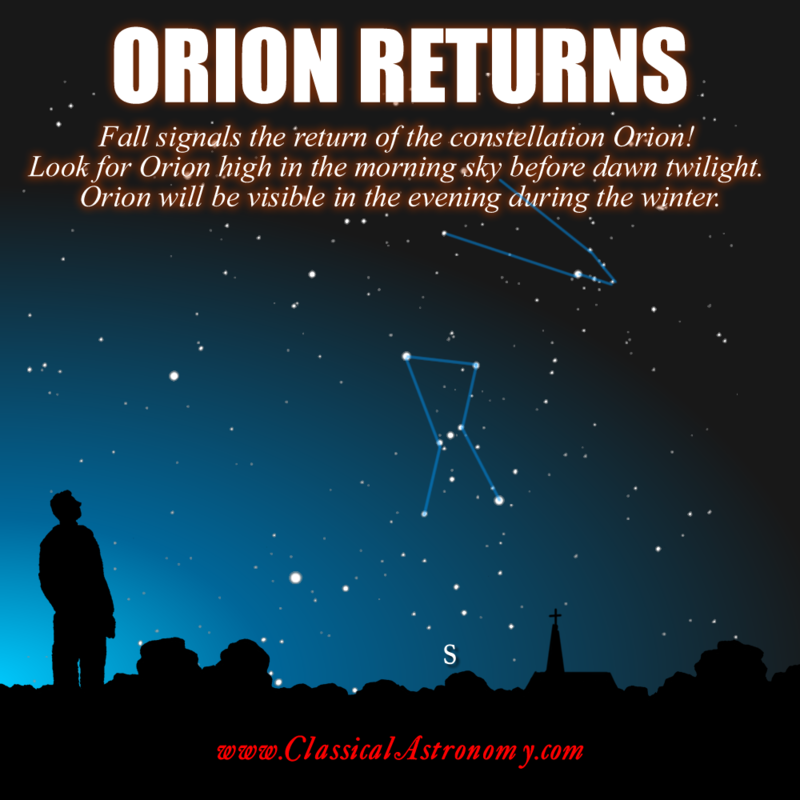 By the first day of winter in December, Orion will be at the meridian at midnight, but visible rising in the evening. Orion will be prominent throughout the winter. By the first day of spring, Orion will rise invisibly in daylight and be at the meridian at sunset.